My first successful star hop to Neptune tonight, tried it a few times before but in my city skies I always had trouble. 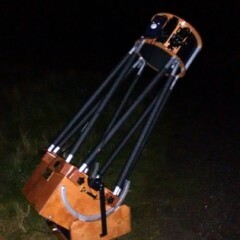 Using my 8.5" F7.5 newt, First centred mars in the quickfinder then moved up to the star Hydor just above it. Switching to the 9x50 raci I could make out the grouping of three stars in an almost vertical line about 2 deg to the west.... with 81 and 82 acqui top and middle and at the bottom is Neptune according to sky safari. Centred the crosshairs on this bottom "star" and then looked through the 18mm BCO, a dark blue star, switching to the 10mm BCO giving 160x and it reveals itself as defintely not a star... Neptune at last! More power does nothing as I'm looking low over a load of houses with their heating on, so I stay with the 10mm and just watch the blue giant as it drifts along. Very pleased! Well done Craig. Neptune is particular well placed for me at the moment and easy to locate due to the other objects you described. Neptune is quite a prize once you've found it. In the scope, it's an unmistakable little blue disc with the tiny blip Triton following closely. I'm looking forward to getting an image of Mars and Neptune as they appear close together within a low-power telescopic view on Dec. 7! I've seen Triton with my 130mm refractor and the 12" dob but I can get down to mag 14-15 here. It's nice to see these distant outposts of the solar system even if they don't amount to much in the eyepiece ! Congrats! Me too - I was chuffed to finally see Neptune with my very own eyes, and to also catch Triton too. Pretty amazing what a couple of mirrors and lenses can do! It really blows my mind actually! It's funny how sometimes the most underwhelming views in the eyepiece give you the most satisfaction... just the thought of just what it is you're looking at with your very own eyes. I got a glimpse of Neptune also just 2 days ago. Since it was very close to Mars, finding it wasn't too hard. Best view of neptune was around 8 years ago with my CpC800 could just make out some small detail. I would like to do some imaging now I have an imaging setup.